The Andersons, Sylvania, 6– 8 PM. 1. Zocker Gruener Veltliner, 2. Manoir du Carra Fleurie,3. Barista Pinotage, 4. Inkling Rose. Flight $7 or nominal fee per sample. 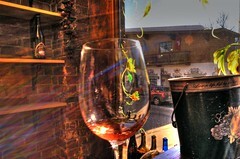 Zinful Wine Bar & Restaurant, (419) 878-9463, 7541 Dutch Road, Waterville. 6:00 – 9:00 PM. . Nominal fee per sample. Andersons, Maumee, Wine Tasting. 5-7 PM. Great Winter Wines: 1. 2010 Decoy Cabernet Sauvignon, 2. 2008 Trenza red blend, 3. 2010 Seghesio Zinfandel, 4. 2011 Gysler Scheurebe Halbtrocken. $7.50 per flight or nominal fee per sample. Aficionado Wine and Cigars, The Shoppes at RiverPlace, 26567 N. Dixie Highway, Suite 135, Perrysburg, (419-873-4444). 5:00 – 8:30 p.m. Spanish Reds: 1. Castillo de Monseran Garnacha, 2. Vina Zorzal Graciano, 3. Juan Gil Monastrell, 4. Baron De Ley Reserva Rioja. $10 tasting. Walt Churchill’s Market, 3320 Briarfield. Maumee, (419) 794-4000. 12:00 - 5:00 PM. Bordeaux Part 1 – The Left Bank. In the first of our three-part series on the world's most important wine producing region, we focus on wines west of the Gironde river. This includes many of the world greatest Cabernet Sauvignon wines from Pauillac, St Estephe, St Julien, and more... We're tasting lots of high-rated wines from the great 2009 vintage as well as some excellent wines from older vintages. Premium tasting.